It is possibly the first time in history that the Indian cricket team has two potential contenders for the allrounder's spot. The unexpected emergence of Vijay Shankar on the scene has provided the much-needed aid to the team in the absence of its foremost choice - Hardik Pandya. Vijay Shankar hails from Tamil Nadu and burst into the headlines out of the blue when he was named as the replacement for Bhuvneshwar Kumar in the squad for Test series against Sri Lanka in 2017. However, he didn't get to play any game in the series and only warmed the bench. Shankar plays for Sunrisers Hyderabad in the IPL and though he didn't feature in many IPL games before getting picked for the national team, he has been a part of a few IPL franchises in previous seasons. He is a recognised figure in domestic cricket for his all-around cricket abilities, even if he is not very popular in IPL. Therefore, his selection for the national team was a surprise for many. Introduction to international cricket can be scary to a few. And, no one can explain this better than Vijay Shankar. The Nidahas Trophy was Shankar's first assignment at the international level. In the first few games of the tournament, he chipped in with few wickets but didn't get to bat until the final of the tournament. And, when he finally got the chance to bat in final, India was caught in a tricky situation. While chasing the target of 167, India had been reduced to 94/4 in 14 overs when Vijay was sent to bat. Things spiralled out of control for Vijay Shankar as he collapsed under the pressure and almost lost the match for India. However, Dinesh Karthik came to the rescue in the final overs and delivered last-over heroics to turn the tide in India's favour. 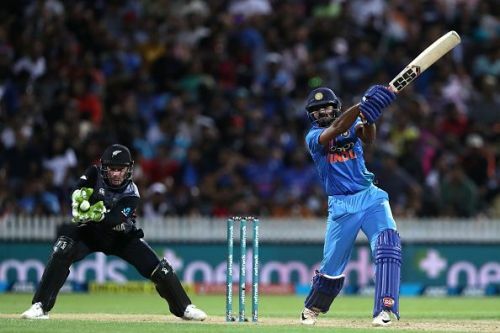 Despite India's thrilling win from a losing position, Vijay Shankar was criticised heavily for his sloppy innings of 17 off 19 balls. His confidence was shattered but that didn't deter him. He continued working hard at domestic level. So, when Hardik Pandya was ousted from the team for his controversial remarks on a TV show, he was recalled to fill Pandya's shoes. He joined the team for the last ODI against Australia in Melbourne earlier this year. He made his ODI debut at MCG but didn't get the chance to bat; though, he was economical in his six-over spell. He has been a part of the team since. Shankar is a medium pace bowler with sound batting technique. Though Shankar has not been entrusted much with bowling, he has impressed with the bat every chance he has got. He has also proven his ability to bat in the middle-order by scoring important 30s and 40s. His eloquent knock of 46 runs in the second ODI against Australia in Nagpur bolstered his credibility. And later, when he was asked to bowl the last over with just 11 runs to spare, he picked two wickets to curtail the Aussies. Pandya is presently nursing a back injury, and with this series being the last ODI series before the World Cup, it is the best opportunity for Vijay Shankar to make a case for the allrounders spot in the team. Vijay Shankar is a mainstay in the Sunrisers Hyderabad team and is expected to play a key role in this year's IPL campaign. The IPL is the last professional tournament before the World Cup, so his performance in the IPL will go along way to determine his chances for the World Cup team. Hardik Pandya might have a proven track record and a lot of experience, and so might be Virat Kohli's first choice. However, if Shankar continues to play with his characteristic exuberance in the remaining ODIs of the series, and also does well in the upcoming IPL season, his claim for a seat on the flight to England will become stronger. And who knows, he might even get to play in the World Cup. Can Vijay Shankar be accommodated at number 4 in the World Cup?